Where's your most favourite airport in the world? I often get asked that question because I travel a lot and I've been to many airports around the world. Without hesitation I'd always answer Changi Airport in Singapore. If you ask me the reasons, well I can easily write a long list of it. 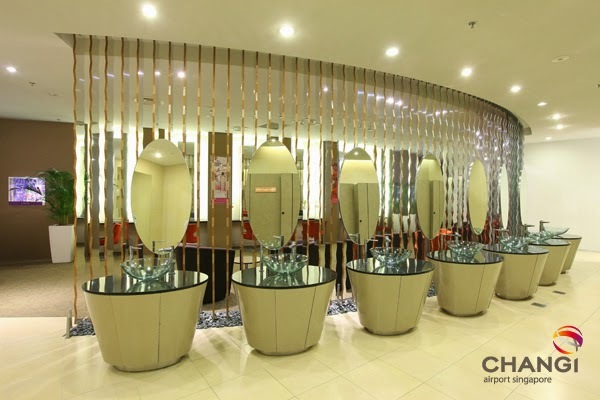 But what made me fall in love with Changi Airport in the first place was their super clean and spotless washrooms. "WHAT?!" I could see your confused face while raising your eyebrows. Yes, one of my biggest pet peeves is dirty public toilet. It's a pretty big deal for me because I usually drink gallons of water before a long haul flight. Naturally I'll visit the washroom often and all I need is a stink-free clean toilet. Thank you. 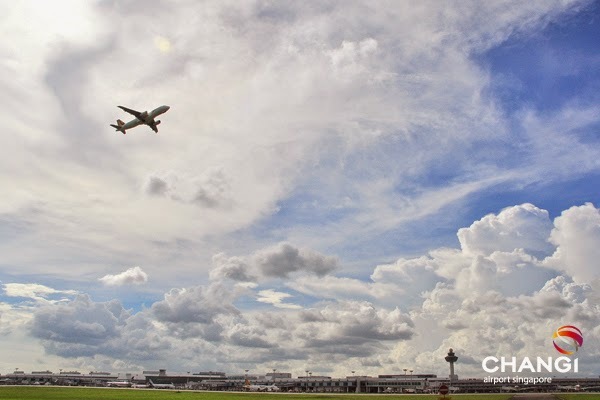 Changi Airport is one of the busiest international airports in the world. It's a major air hub in Asia serving more than 100 international airlines flying to more than 300 cities around the world. 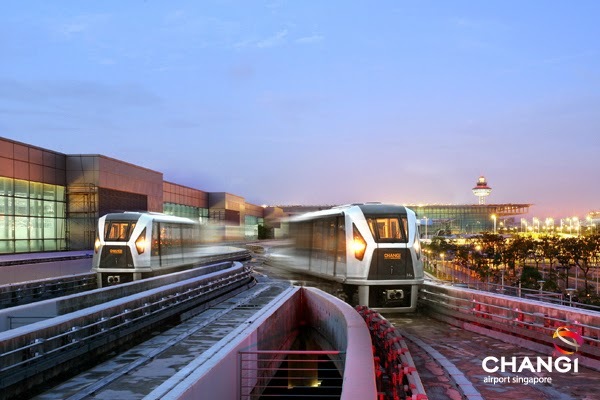 There are 3 terminals in Changi Airport and all are connected by the Skytrain. Recently between my flight Surabaya-Singapore and Singapore-Bangkok, I had couple of hours to do an airport tour here. If you have ample time before your next flight, I'd also recommend you to explore all the 3 terminals. Each of terminals has it's own uniqueness. 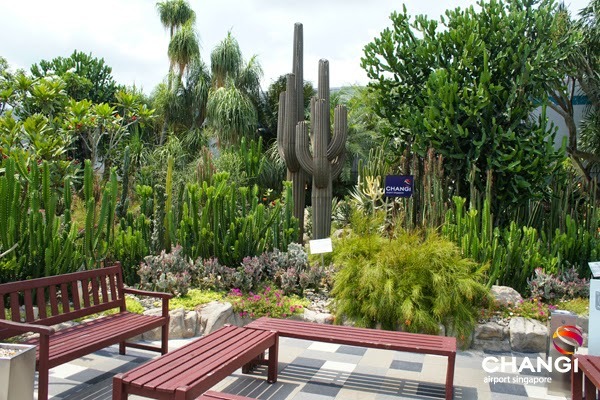 Such as Cactus Garden in Terminal 1, Sunflower Garden in Terminal 2 and Butterfly Garden in Terminal 3. It's like finding an oasis in the middle of the hustle bustle of an airport. There's also a transit hotel in each terminal. In case, all you need is a quiet room to get some quality sleep and a good shower. There are two different rates available depending on whether you choose a standard room or a budget room. 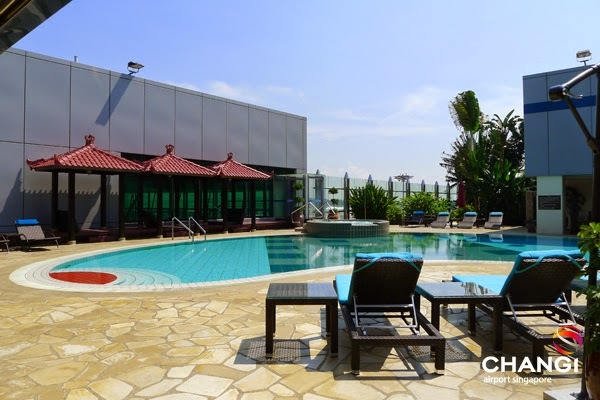 To stay in these hotels, you don't need to go through the immigration or custom. 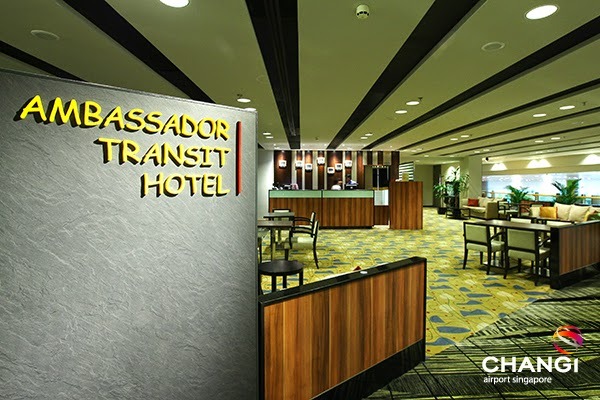 In all terminal, Ambassador Transit hotel are located in the level 3, within the departure transit lounge. 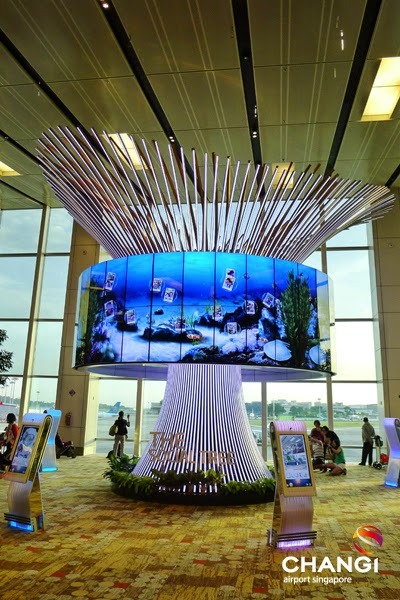 Now let's talk about The Social Tree, a new attraction in Terminal 1 which looks really cool and futuristic. I was excited when I saw this 9 metres tall tree. First I took my picture in one of eight touch screen photo booths around this tree. Next step, I was having fun playing around with this photo booth where I could choose some cute frames and stickers to decorate my photo. When I was done editing and clicked the 'submit' button and then BAM! 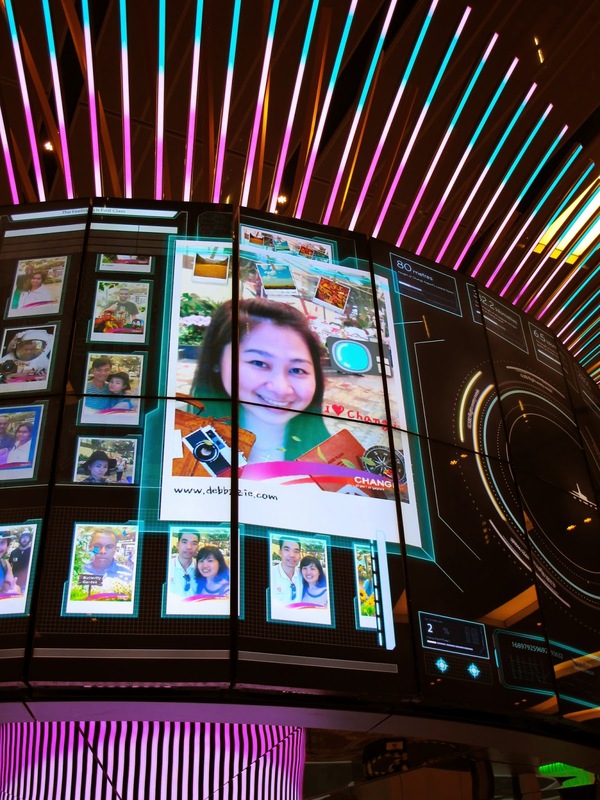 my picture appeared on the giant screen. I can always retrieve my picture at any time and it will be stored for a hundred years! Amazing, huh? Now I understand why the tag line is "Leave behind a memory at the Social Tree". Hey you know what? 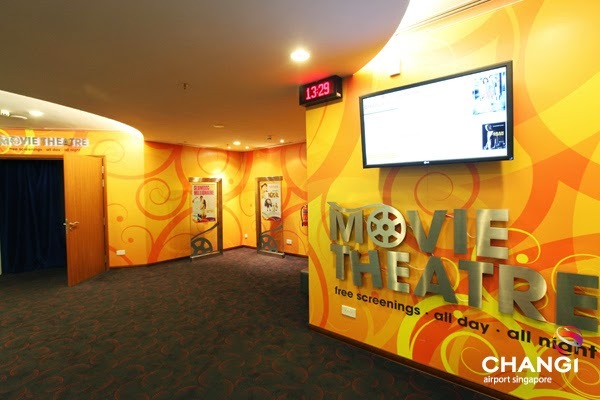 You can always choose some favourite movies to watch for free in the Movie Theatre. 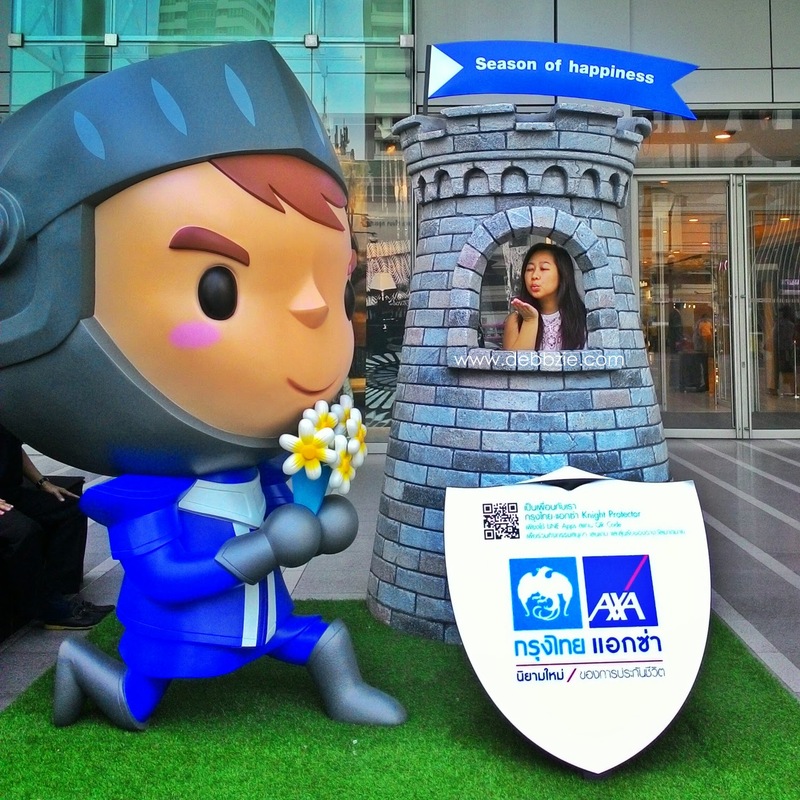 They are located at Terminal 2 near the Sunflower Garden, level 3 and at Terminal 3 near the Ambassador Transit Lounge, level 3. Beware though, not to get too comfy or you'll miss your next flight. Last but not least.... Changi Airport is a food heaven! Since I barely eat anything during the flight, I have to make sure to eat something before I board the plane. There are so many food options to choose in Changi Airport. In fact, they have about a million food outlets across Terminal 1, 2 and 3. Okay, I exaggerate. 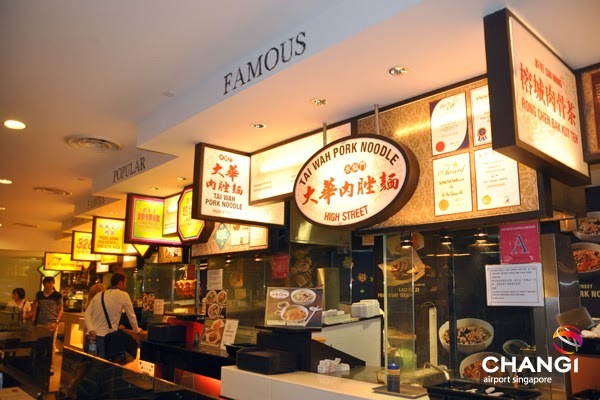 It's actually more than 120 food outlets with a great diversity of cuisine. The recently renovated food court in Terminal 3 is named 'Singapore Food Street'. You might just be transiting and don't have time to explore the city, but you still can sample some of Singapore signature dishes. Isn't that brilliant? After all, Changi Airport is like a huge playground for me. Every terminal is unique and has a lot to offer. 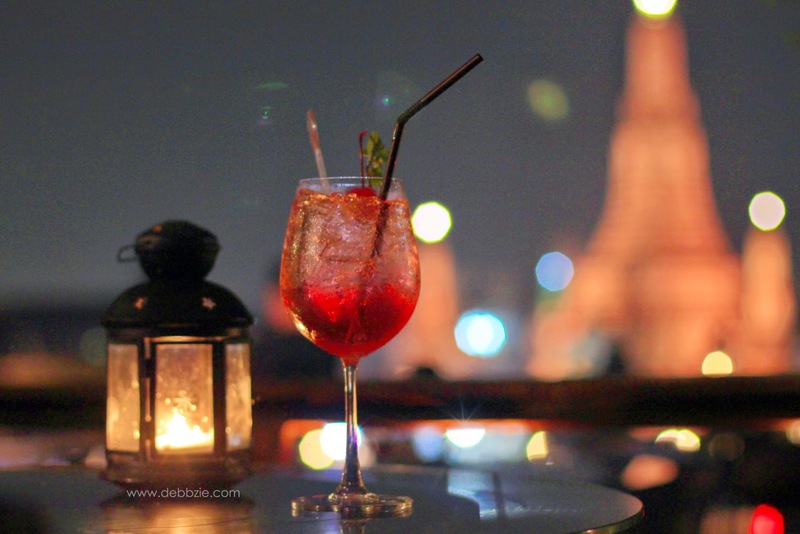 There's always something new to discover and to do before departing to my next destinations. Airport is a place of "Hello" and "Good Bye". And in Changi Airport it will surely be a special one. To all my Indonesian friends, do you know that Changi Airport has launched a website in Bahasa Indonesia for us? It's www.id.changiairport.com. Make sure to visit it to get the latest updates or events and some promotions you would not want to miss. How about you? 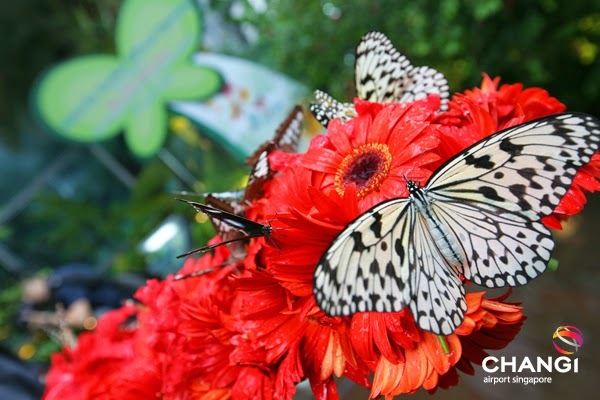 What's your favourite things to do in Changi Airport? It's Christmas day so I'll throw another freebies! 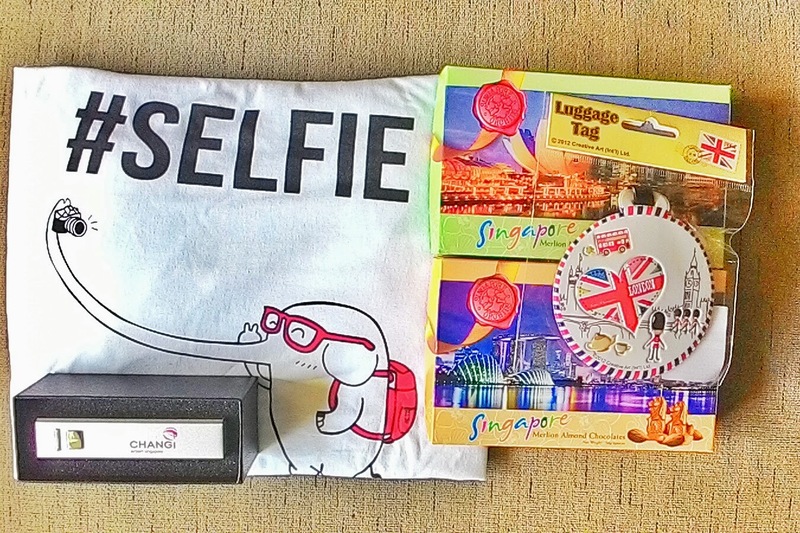 There will be one winner who will get this package of a Changi Airport power bank, a cute 'selfie' T-shirt, chocolates and a luggage tag. 3. Don't forget to leave your email address and twitter or instagram user ID on the comment box below. 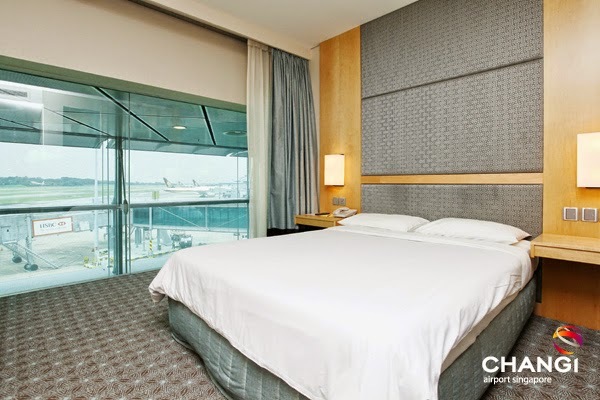 * My trip to Bangkok is fully sponsored by Jetstar Asia and Changi Airport. However all opinions are based on my experience and the words are all mine. 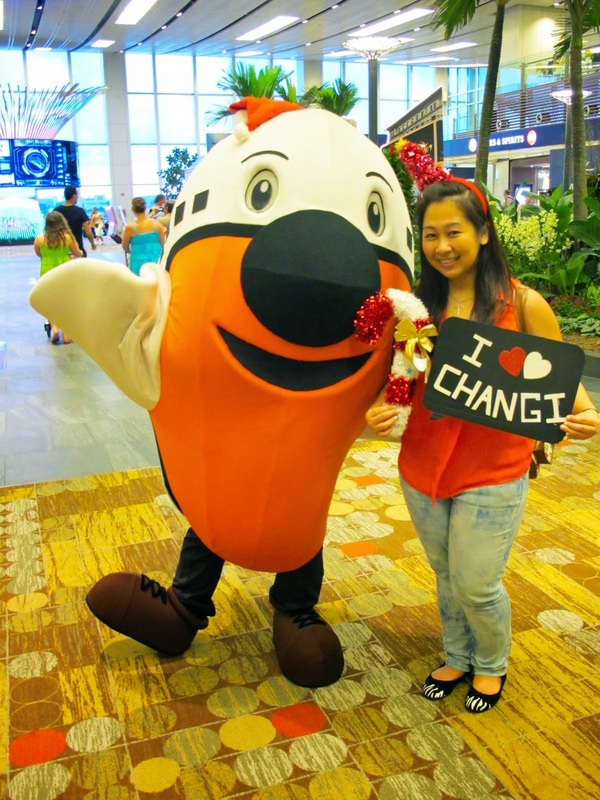 Special thanks to the ever so friendly and lovely Wei Shan for taking me around Changi Airport. Yes, I have a pretty serious condition of fear of flying. No, I wasn't born with it. My first air plane ride when I was one year old baby. And because my Dad travels overseas very often for business trip, I've became a frequent flyer too. I loved flying. Airport was my favourite place and I could even memorise most air plane logos. Besides visiting new places, flying was one of my most love things to do. Then it all has changed 15 years ago when I experienced a super severe turbulence that my plane had to go through an emergency landing. It was really a 'near death' experience for me. Since that day, flying has been a dreadful thing to do. I avoided flying for almost a year. Even the view of air planes in the sky would caused my heartbeat racing and my body shook uncontrollably. Yes, the trauma was that bad. But at one point, I decided to fight my phobia. I won't give up my passion for travelling. 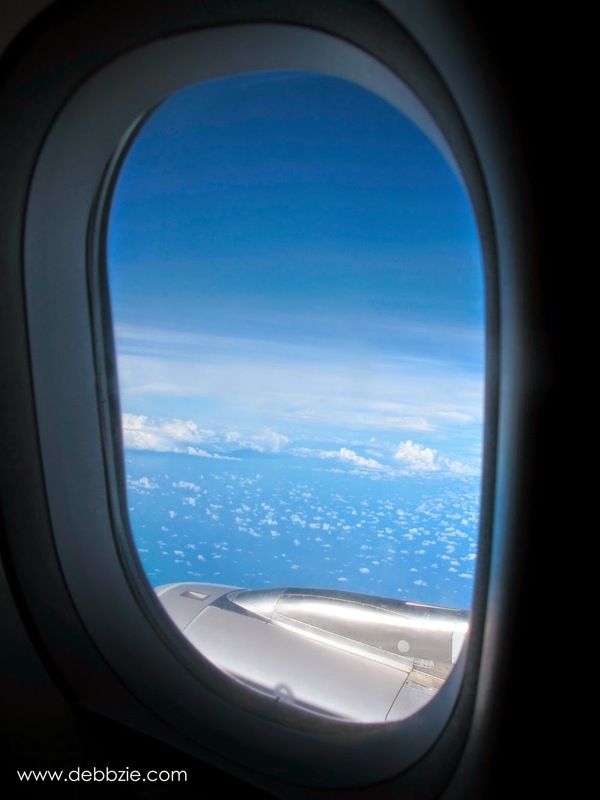 One thing that significantly changed, I've became very fussy in choosing airlines. I'd do some research before travelling and would only pick airlines with great safety records. Even if that means sometimes I have to fork out more money for the flight tickets. I've also became fussy in picking my seat on plane. I must must get a window seat otherwise I get panic attack easily during the flight. So much for a person who travels regularly like me. I wish I was as flexible as I used to. Anyway, I was happy when recently Jetstar Asia approached me and invited me to experience flying with them. 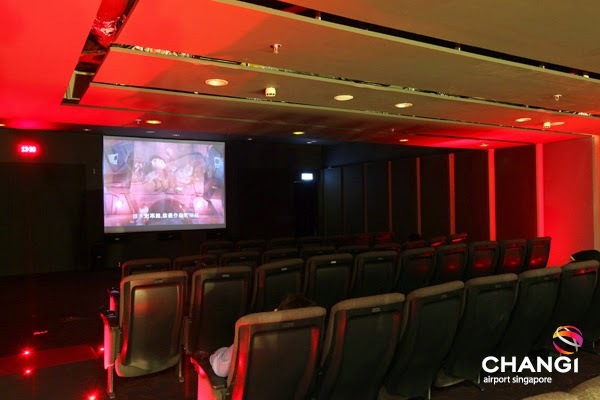 Jetstar is a low-cost airline which is a wholly owned subsidiary of Qantas and Jetstar Asia which is based in Singapore - is one of its sister airlines. 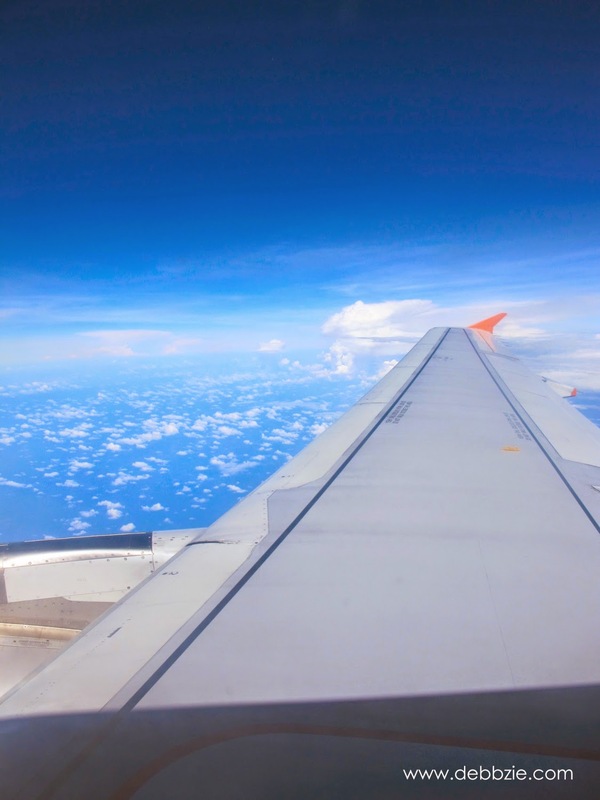 I've been flying Jetstar Asia pretty often on Surabaya-Singapore route. Yup, Jetstar is one of some airlines that I feel comfortable and feel safe to fly with. 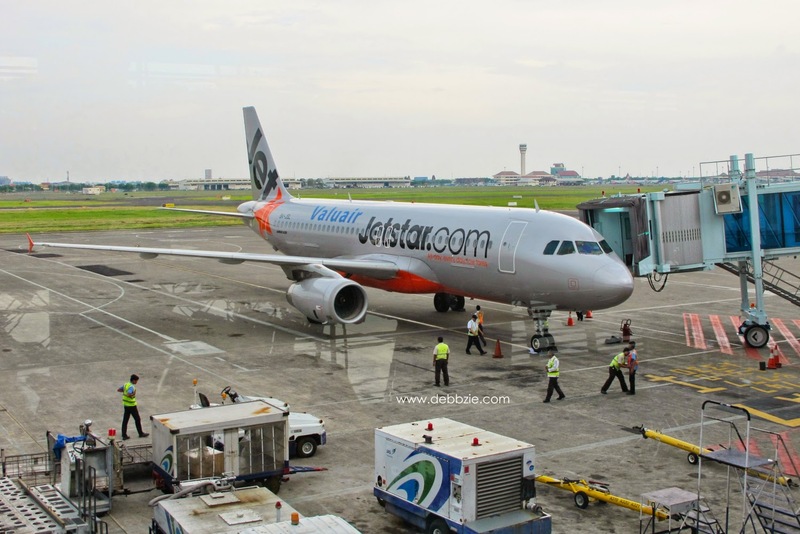 From Singapore, Jetstar Asia operates services to some Asia countries such as Vietnam, Thailand, Philippines, Burma, also Japan and China. 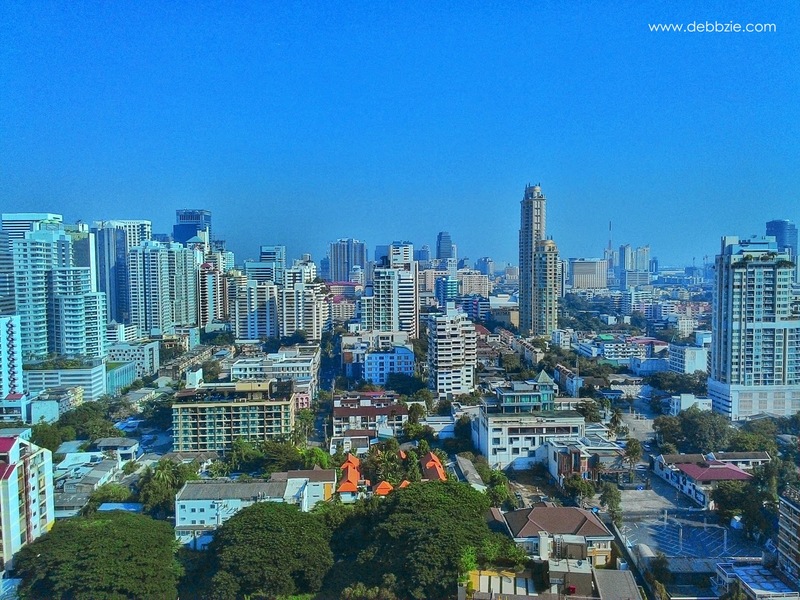 I originally chose Vietnam but after some consideration (my Dad's health problem and I needed to submit my passport for Schengen visa immediately), I decided to fly to Bangkok instead for 5 days. 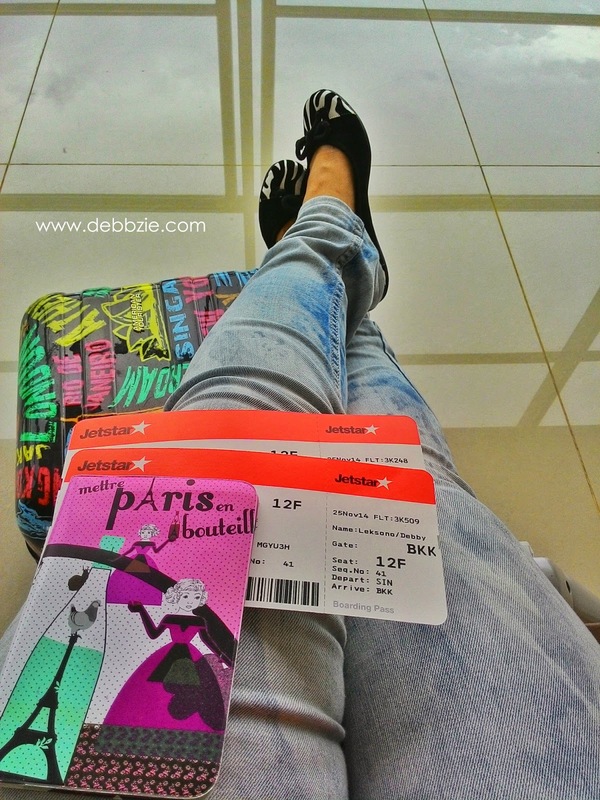 My journey started off in Surabaya where I catch my first leg of flights to Singapore. Checking in was easy breezy. Though the flight was full, the queue at check in counter moved pretty fast because the staff worked efficiently. I'm a person who hardly enjoy in-flight meal. The reason is I'm very prone to motion sickness and also I found most in-flight meal are too bland for my Indonesian taste buds. But during Jetstar Asia return flights between Surabaya - Singapore - Bangkok, I was served and got to taste some of their in-flight meals. My favourites were the Chicken Rice and Roti Paratha with chicken, they tasted pretty good. I'd recommend you to pre-purchase and select your preferred meal on their website though or else you can always purchase drinks and snacks on board. 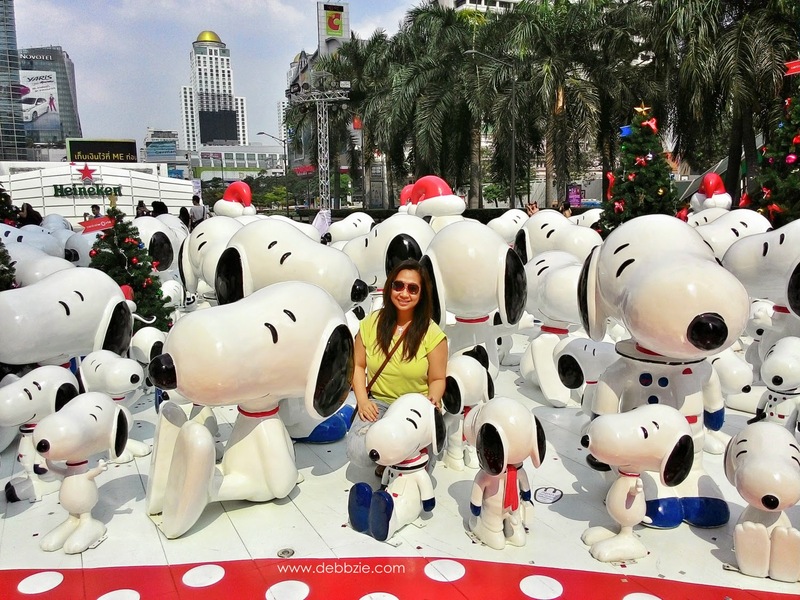 I didn't really have any itinerary for my trip to Bangkok. I only had 'food tour', 'shopping' and 'Thai massage' in my mind. After all it was my birthday trip so I think it's okay to pamper myself once in a while, right? My last visit to Bangkok was 12 years ago so unsurprisingly I hardly recognise it. I went crazy shopping at Platinum where there are too much cute stuff to ignore. Not to mention they are very cheap too. I went "Ouch! Ouch! ohhhh ahhhh... gimme more!" during the Thai massage session. But highlight of my trip would be the Midnight Food Tour by Tuk Tuk that I joined with the local agent. Beside sampled some local food, I also got to enjoy beautiful night illuminations around some temples in Bangkok. To top it off, I laughed my head off while my tuk tuk was speeding and racing with a BMW car on the highway. Thrilling! I'm sure it won't be long until they release the latest movie of Need For Speed: The Tuk Tuk. Lol. Now, I want a Tuk Tuk as a Christmas present, can I? There was a little hiccup on the end of my journey. I was waken up early morning by an sms from Jetstar saying that my flight from Bangkok to Singapore will be delayed for about 2 hours. That means I would be too late to catch my connection flight from Singapore to Surabaya. Jumped out my bed in panic, I tried to contact Jetstar. And thank goodness, almost immediately they managed to put me on earlier flight to Singapore. Phew! All in all, I had a great time flying with Jetstar and my Bangkok trip was nothing less than awesome. Thanks a bunch, Jetstar for the great and safe journey! 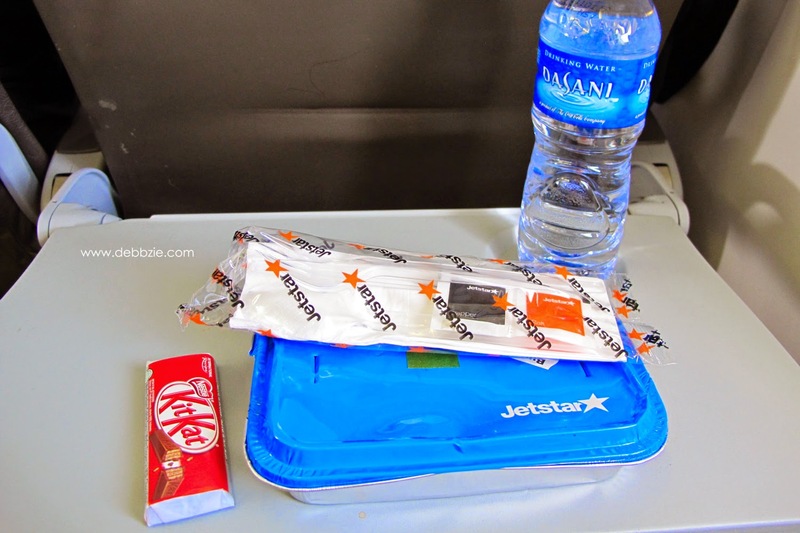 I'm giving away this Jetstar Comfort Pack worth SGD17 that I bought from their in flight shopping. It's a package of stuff that's very useful for travelling. Contains of a deluxe blanket, inflatable neck support pillow, toothbrush & toothpaste, earplugs, socks, eye shade and their premium lip balm from Australia's Bloom Cosmetics. All items inside a trifold pouch which can be used as your tablet pouch. 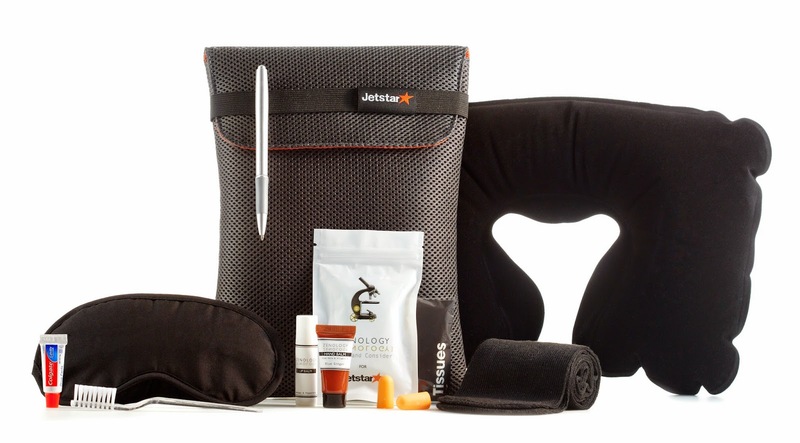 Besides this comfort pack, you will also get a Jetstar 2015 desk calendar. So let's join this freebies! All email address will be drawn randomly and 1 (one) winner will be sent this awesome pack. 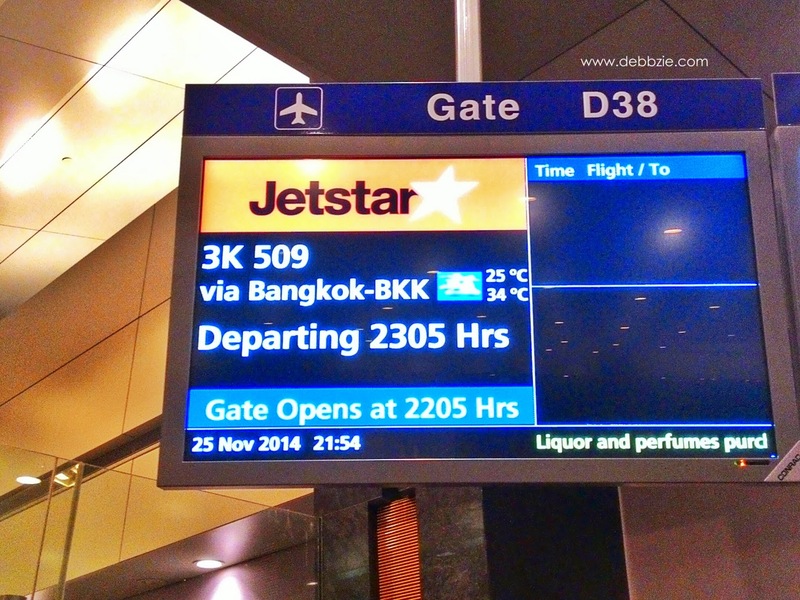 * My trip to Bangkok is fully sponsored by Jetstar Asia and Changi airport. However all opinions are based on my experience and the words are all mine. Special thanks to Tyler who has been so kind and helpful, making sure that my trip was flawless.